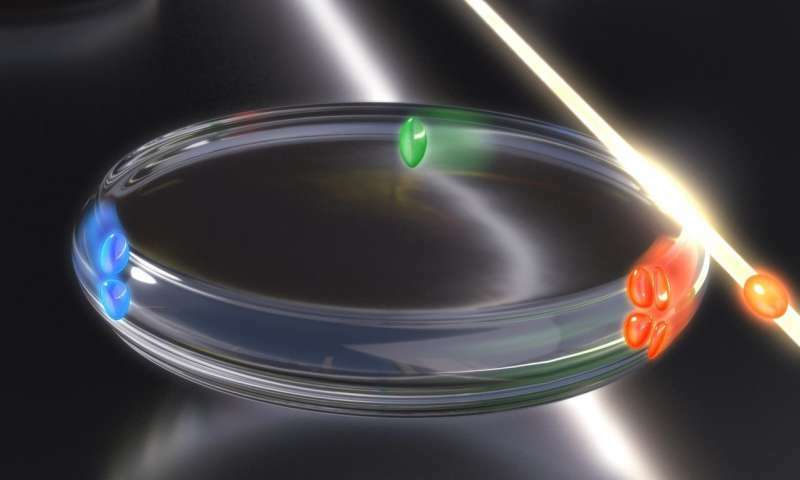 Ultrashort optical pulses are becoming increasingly relevant in a number of applications, including distance measurement, molecular fingerprinting and ultrafast sampling. 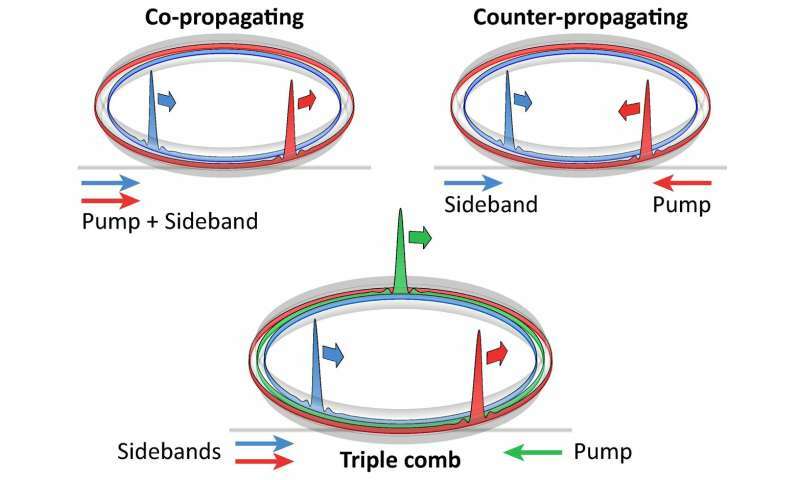 Many of these applications rely not only on a single stream of pulses—also known as "optical frequency combs"—but require two or even three of them. Nonetheless, these multi-comb approaches significantly speed up acquisition time over conventional techniques. These trains of short optical pulses are typically produced by large pulsed laser sources. Multi-comb applications therefore require several such lasers, often at prohibitive cost and complexity. Furthermore, the relative timing of pulse trains and their phases must be very well synchronized, which requires active electronics that synchronize the lasers. In a new paper published in Nature Photonics, the research team of Tobias J. Kippenberg at EPFL, together with the group of Michael Gorodetsky at the Russian Quantum Centre, has developed a much simpler method to generate multiple frequency combs. The technology uses small devices called "optical microresonators" to create optical frequency combs instead of conventional pulsed lasers. The microresonator consists of a crystalline disk of a few millimeters in diameter. The disk traps a continuous laser light and converts it into ultrashort pulses—solitons—thanks to the special nonlinear properties of the device. The solitons travel around the microresonator 12 billion times per second. At every round, a part of the soliton exits the resonator, producing a stream of optical pulses. The microresonator the researchers used here has a special property in that it allows the light to travel in the disk in multiple spatial modes of the resonator. By launching continuous lightwaves in several modes at the same time, multiple soliton states can be obtained simultaneously. In this way, the scientists were able to generate up to three frequency combs at the same time. The method has several advantages, but the primary one is that it does not require complex synchronization electronics. "All the pulses are circulating in the same physical object, which reduces potential timing drift, as encountered with two independent pulsed lasers," explains Erwan Lucas, first author of the paper. "We also derive all the continuous waves from the same initial laser by using a modulator, which removes the need for phase synchronization." The authors are now working on developing a new demonstration with the triple-comb source: "We had not planned for a demonstration, as we did not expect our scheme to work so easily," says Lucas. "We are obviously working on it." Holographic Storage uses optical rings.